For Jameson, at that time, it was paradoxically realism that offered the possibility of a new political aesthetic, as modernism’s aesthetics of fragmentation and estrangement had become irredeemably reconciled to the logic of the market and consumer capitalism. The renegotiation of realism and modernism was put on hold for the next two decades, however, as Jameson emerged as the most prominent Marxist theorist of postmodernism. Since the late 1990s Jameson has made a welcome, to some of us at least, return to the question of modernism and modernity with a series of works: Brecht and Method (1998), A Singular Modernity (2002) and the collected volume The Modernist Papers (2007). With The Antinomies of Realism we finally return to that long deferred renegotiation of realism but, as we will see below, against a background of the eclipse of modernism by full-blown postmodernism. Thus, Jameson’s approach to realism will not follow any of the traditional approaches to the problem. He quickly runs through Auerbach, Bakhtin, Lukács and Sartre (2013, 1-5) only to inform us that he will not follow any of these directions, but will address the issue dialectically. It is in this sense that Jameson will historicize realism, insofar as history and the dialectic are at one with each other, and history “can only be the problem of which it claims to be its own solution” (6). 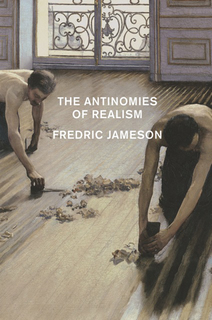 Approaching realism through temporality and what he sees as the twin sources of realism, the narrative impulse and affective investment, Jameson generates a startlingly original reading of realism. As the narrative impulse is clearly older than the realist novel, a modern but not modernist form, Jameson locates this particular impulse in the tale and storytelling, or récit, and this introduces the first complexity into our sense of temporality. Storytelling is based on a notion of irrevocability, or an unheard-of event that becomes memorable and worthy of retelling over and over again and, as Walter Benjamin taught us some time ago, what binds such events together is the experience of death. Storytelling, for Benjamin, is not so much biography as obituary, as the event has always-already happened and is in the past, hence the centrality of death to the novel (1968 ). The temporality of this irrevocable but memorable event is thus redefined in the story as ‘what cannot be changed, what lies beyond the reach of repetition or rectification, which now comes to be seen as the time of everyday life of routine’ (2013, 19). Affect, on the other hand, points us towards not the past but the present; to speak of affect, observes Jameson, is to speak of the body or the postmodern “reduction to the body” and its specific temporality of a “perpetual present.” The discussion of the narrative impulse, death and affective investment in the first two chapters of The Antinomies resonates with Peter Brooks’ Freudian inflected model of narrative in Reading for the Plot (1984), especially with Brooks’ interest in nineteenth century literature, but as we will see below Jameson steers away from the psychoanalytic perspective. In short, Jameson approaches realism as a paradox or aporia, a literary form constantly struggling with its own conditions of possibility to narrate the past and its dissolution in the literary representation of affect in a perpetual present. It is this historically new realm of affect that creates the irreconcilable tension of realism; as Jameson notes, “to resolve the opposition either way would destroy it” (26). But he does not go further into the technicalities of affect or the controversy around whether or not one can meaningfully speak of “unconscious affects.” In contrast to named emotions, affect does not “mean” anything. What is important for Jameson is affect’s relationship to the body and the possibilities of its combination with the longer-range forms of temporality of storytelling, récit and destiny (46). Thus, for example, Zola’s novels offer us immense accumulations of bodies in movement across space, where the sheer overload of sensations and intensities inscribed on these bodies intersects with the pseudo-scientific notion of “tainted heredity” as a unique form of temporality. History intersects with personal histories in the sheer excess of “bodies in full effervescence, paralysis or decay” as affect thus becomes “a symptomatology reinforcing the great realist project at the very moment it imperils it” (76). The Antinomies is such a wide ranging book that it is difficult to capture its sheer breadth in a short review. In the first half of the book Jameson focuses on the twin sources of realism, analyzing the formal function of happiness in Tolstoy and mauvaise foi in George Eliot. He moves from an analysis of plot in Zola to character systems and the waning of “protagonicity” in Pérez Gladós (that is to say, even the protagonists of Gladós are essentially minor characters, as the historical conditions slowly render individualism meaningless), the role of the villain in Eliot to problems of genre and the function of pronouns in Flaubert and Henry James. Jameson’s own narrative arches from the emergence of realism in the tale and récit to its dissolution in modernism’s “uncontrolled linguistic production” (187) in the works of Joyce, Woolf and Henry James. It concludes with a brief coda on the sundering of narrative and affect in the, perhaps, anachronistic work of Alexander Kluge. I must admit that at times I was not sure affect was the right word to describe what Jameson was talking about here, which was often much more to do with the transformation of bodies and subjectivities than affects as such. Part two of The Antinomies shifts the focus from specific authors to more general issues of form. “Experiments of Time” addresses issues of salvation, providence and destiny. “War and Representation” concludes that war is fundamentally unrepresentable and virtually non-narrative today. The long concluding chapter “The Historical Novel Today” draws together many of the preceding discussions arguing that the popularity of the historical novel today must be grasped as a symptom or symbolic compensation for the decline of historical consciousness itself. Jameson does not cite specific examples here but refers to “Harlequin histories” or romantic tales set against this or that costume setting; the attempt to reconstruct historical situations in which “real” historical figures made some fateful decision; and finally, the attempt to capture the “feel” of some great event through the eyes of an imaginary character. In other words, he identifies the very kind of postmodern historicism and pastiche that we are familiar with from his long standing concern for the loss of historicity in the era of postmodernity. This shopping list of potential responses to the progressive impossibility of the historical novel in the Twentieth century thus underlines Jameson’s long standing concern for the loss of the historical referent and its dissolution in the globalized economy of the image. Paradoxically, then, the historical novel is an impossible form or genre that is still massively practised and hugely popular. How, asks Jameson, can we account for this when the conditions of possibility of such a form, the nation state, have declined? The answer to this lies in the fact that the “true historical novel, today, is not the historical novel at all but rather realism as such” (262). Hilary Mantel stands in for the contemporary historical novel and her huge popularity certainly attests to its continuing cultural centrality. If Mantel provides us with a model of the historical novel today what is the future for this impossible form? Here we shift to familiar Jameson territory. As Jameson writes, “the historical novel of the future (which is to say of our own present) will necessarily be science-fictional inasmuch as it will have to include questions about the fate of our social system” (298). The examples Jameson provides here are drawn from film, in particular Christopher Nolan’s Inception (2010), but the appearance of film and mass culture at the end of this discussion of the historical novel raises an issue that he does not explore here. Surely the best examples of the persistence of realism in our culture today are to be found on television. I am not thinking here of reality TV as such but of those magnificent series that have been produced by US commercial television in the past two decades such as The Wire, Breaking Bad and Deadwood. This would surely have been the place to bring in these contemporary forms of realism, not least because Jameson himself has written so insightfully about them in the past (2010b). Benjamin, Walter. “The Storyteller: Reflections on the Works of Nikolai Leskov.” Illuminations. Ed. Hannah Arendt, Trans. Harry Zohn. London: Fontana Press, 1968 . Print. Brooks, Peter. Reading for the Plot: Design and Intention in Narrative. New York: Alfred A. Knopf, 1984. Print. Cunningham, David. “The contingency of cheese: On Fredric Jameson’s The Antinomies of Realism.” Radical Philosophy. 187 (2014): 25-35. Print. Danius, Sara. “About Fredric R. Jameson.” Holberg Prisen. Holberg Prize, 2008. Web. 25th June 2014. Jameson, Fredric. “Reflections in Conclusion,” Adorno et al. Aesthetics and Politics. London: Verso, 1977. Print. —. The Hegel Variations: On the Phenomenology of Spirit. London: Verso, 2010a. Print. —. “Realism and Utopia in The Wire,” Criticism, 52: 3-4 (2010b): pp. 359-72. Print. Johnston, Adrian and Malabou, Catherine. Self and Emotional Life: Philosophy, Psychoanalysis and Neuroscience. New York: Columbia University Press, 2013. Print. Lacan, Jacques. The Four Fundamental Concepts of Psycho-Analysis. Ed. Jacques-Alain Miller. Trans. Alan Sheridan, Harmondsworth: Penguin, 1977 . Print. Lukács, Georg. “Narrate and Describe?” Trans. And Ed. Arthur Kahn. Writer and Critic and Other Essays. London: Merlin Press, 1970. Print. Rycroft, Charles. A Critical Dictionary of Psychoanalysis. Harmondsworth: Penguin, 1968. Print. Although, as David Cunningham (2014) notes, The Antinomies of Realism does carry on a subterranean dialogue with Lukács, in particular the essay “Narrate or Describe?” (1970), as Jameson seeks to redeem Zola from Lukács’ critique. Sean Homer is Associate Professor of Literature at the American University in Bulgaria. He is author of Fredric Jameson: Marxism, Hermeneutics, Postmodernism (Polity Press, 1998) and Jacques Lacan (Routledge, 2005). He is co-editor (with Douglas Kellner) of Fredric Jameson: A Critical Reader (Palgrave, 2004) and (With Ruth Parkin-Gounelas and Yannis Stavrakakis) of Objects: Material, Psychic, Aesthetic, a special issue of Gramma: Journal of Theory and Criticism vol. 14 (2006). His recent publications have been on Balkan Cinema and he is currently working on a book on Slavoj Žižek and radical politics in the Balkans.